How should a homeschool co-op set up their Quickbooks account? Do you have something on your website or a resource on how a co-op should set up their QuickBooks accounts? What financial reports do we need to generate monthly? In the homeschooling world don’t usually think of our members as “customers” but that’s what QuickBooks calls them. We also don’t think of collecting registration dues or field trip fees as “sales” but that’s what QuickBooks calls it when you collect money and provide a service. Here are some helpful books written by Lisa London, CPA from The Accountant Beside You, if you are using QuickBooks in your homeschool nonprofit organization. is for users of QuickBooks Online. I recommend QuickBooks online so that several people can log into the record keeping system including a bookkeeper, board members, the Treasurer and an outside accountant. i wish all my larger homeschool clients would use QuickBooks online. If you use the desktop version of QuickBooks, there’s a different book for you. Lisa London, CPA from The Accountant Beside You, also offers classes on QuickBooks which some people prefer to reading books. Overwhelmed by QuickBooks? Help is available. QuickBooks is a great accounting software package, but it can be overwhelming. I have some suggestions to help you learn QuickBooks or get the help you need to use it correctly. Techsoup also has some blog posts on QuickBooks. Running QuickBooks in Nonprofits by Kathy Ivens is a great book. My go-to-referral for all things QuickBooks. The resources listed above are helpful, but they are not specific to homeschool organizations. I can recommend some homeschool moms and dads with bookkeeping experience who can help you. They know QuickBooks and have experience with homeschool organizations. These wonderful bookkeepers can help you get setup (that’s the hardest part), do a monthly or quarterly check up to see if you’re using the software correctly, or fix your QuickBooks file if you’ve blundered it up. Email me to get a recommendation of a homeschool-friendly QuickBooks expert. I encourage my nonprofit clients to use QuickBooks online (or other online accounting software) and now qualified nonprofits can use QuickBooks online for FREE! If you manage bring in than $20,000 in revenues per year I recommend you start using accounting software. If you have more than $50,000 in revenues in a year I HIGHLY recommend you start using accounting software and Quickbooks online is an excellent choice. Make it a New Years resolution for 2017 to start using accounting software and be a better money manager of your homeschool organizations finances. Lots of homeschool parents are depending on you to run your organization successfully. Multi-user so you don’t overburden one person with all the record keeping. Even a bookkeeper or CPA (like me) can log in remotely (with your permission). Online backup so nothing is lost. Email invoices so you can easily track who still owes you. Create reports that show how much money has been spent. Are you afraid of accounting software? It can be complicated, but Tech soup offers some helpful videos. Or if you prefer more personal help I can recommend some homeschool moms and dads with accounting and bookkeeping experience who can help you. They know QuickBooks and have experience with homeschool organizations. These wonderful bookkeepers can help you get setup (that’s the hardest part), do a monthly or quarterly check up to see if you’re using the software correctly, and answer questions you have. You need to be a qualified nonprofit organization, that means nonprofits with 501(c)(3) tax exempt status. You need to re-subscribe each year, but the renewal fee is free. If you don’t take advantage of this offer please tell me why in the comments or email me. I want to understand your concerns or obstacles. We have purchased QuickBooks and our treasurer is working hard to learn the software. What financial reports do we need to generate monthly? We need these reports to be a simple process.The Balance Sheet and Profit and Loss statements in QuickBooks looks overwhelming. QuickBooks can be as simple or as complicated as it needs to be. The reports your treasurer generates is based on what the board wants to see. When I was treasurer, I gave my board a Profit and Loss statement. They really liked to see the budget in one column and actual income and expenses in another column. Then they could see how we were doing compared to our budget. This report can be generated in QuickBooks as a Budget Report. I also created a mini balance sheet/cash flow statement. I took the amount in the checking account and then listed payments to be made. This gave the board an idea of how much cash we had on hand and where it was planned to go. If the statements in QuickBooks are too overwhelming, then perhaps you’re not using QuickBooks correctly. I frequently see QuickBooks users make their Chart of Accounts too long. Then the Profit and Loss becomes 2-3 pages long. I recommend that a Profit and Loss be kept to one page or less. 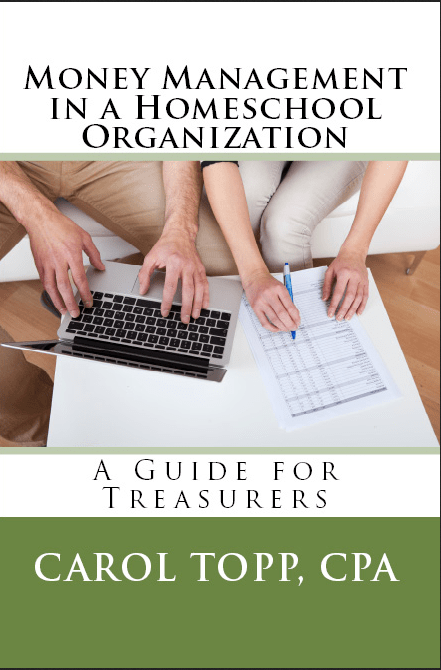 My book Money Management in a Homeschool Organization could be a big help to your treasurer. It has tips, samples and lots of examples. If your treasurer needs help in setting up QuickBooks, I have a list of bookkeepers (all homeschool moms and QuickBooks experts) to help her. She can e-mail me with what needs to be done and I’ll connect her with some experienced help. I hope that helps. I wish you the best of success! Aplos Accounting for Nonprofits: Better Than Quickbooks? I just read a review of Aplos Accounting by Vickey from FreeChurchAccounting.com. One of the great things about Aplos software is that it is made specifically for nonprofits and churches. Aplos was designed by a CPA/Executive Pastor so each section of the software was made with a non-accountant in mind so it’s simple to manage you organization’s accounting even if you don’t have any accounting experience! Aplos software is set up like a check register so entering transactions is just like entering payments and deposits in your checkbook. You can also import your transactions through the bank integration module. Read Vickey’s full review of Apolos. The software is cloud-based, not desktop-based so it’s easy for a new treasurer to take over. It’s also possible for several people to access the financial records including an accountant (like me) who may help your organization prepare the annual IRS Information Return, Form 990. Apolos charges $25/month and Vickey offers a 25% discount for the first 6 months. They also offer a Quickbooks buyback program. Check out Apolos Accounting with a 15 day trial. I am thinking we will need to get QuickBooks to manage our finances. Do we you recommend the nonprofit version? I have not looked much into this yet. Any input is greatly appreciated. I don’t think you need the Nonprofit version of QuickBooks. Usually the Pro version is sufficient. The Nonprofit edition is helpful if you receive a grant and need to track grant expenses. I usually recommend online accounting software instead of purchasing a desktop version. Online accounting means that several people can access your accounting records from their home computers. That’s very important. It also downloads your bank transactions automatically! Wave Accounting. I set up a small nonprofit on Wave recently. It’s working for them and it’s free! Aplos Software which is popular with nonprofits and churches.